← Sugar is the new tobacco: Why are all my healthy foods so full of sugar? Lots of us remember when generally it was a lot colder when we were little. The summers were also less wet too, at least in the U.K. but no-one in their right mind would think of London as being an Artic like city and yet for about 1,000 years in the winter it was exactly that. 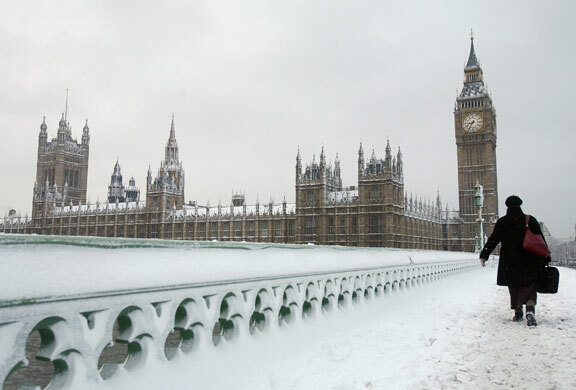 It would get so cold that the River Thames would freeze up, sometimes for 3 months of the year. The first reports of this happening are as long ago as 250 AD and a few centuries later, the Thames was being used as a frozen road, carrying horses and carts and all the other things associated with a busy street of the time. 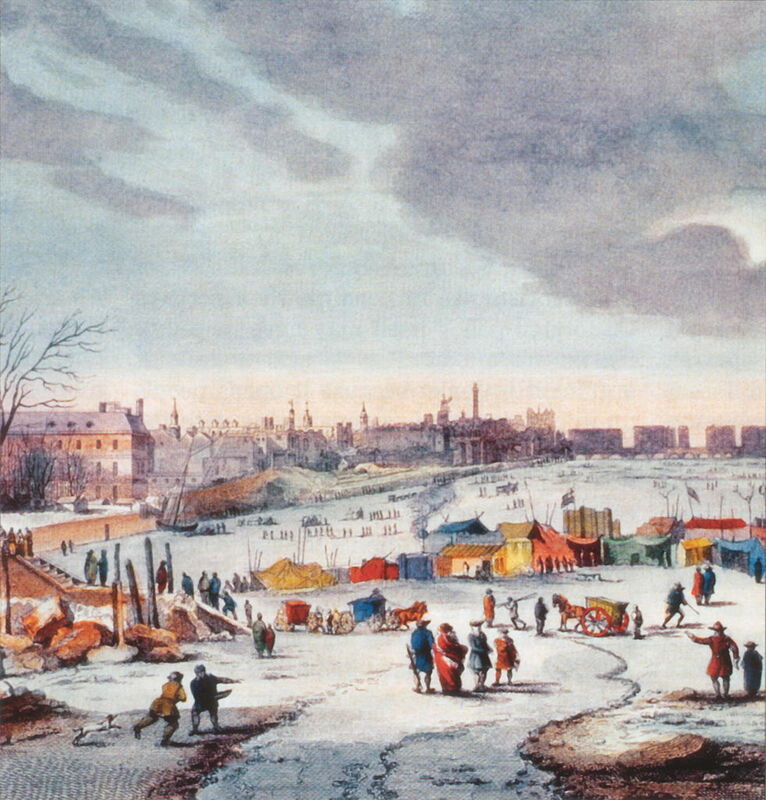 For much of the 14th-19th centuries much of Europe suffered from what was called the Mini Ice Age. The winters in particular were very harsh with the ground being frozen down to several feet and even the southern coasts of England being surrounded by miles of ice just like the northern reaches of Siberia or Canada today. King Henry VIII would travel from London to nearby Greenwich by sledge on the river and his daughter Queen Elizabeth would practice her archery skills on the frozen river. 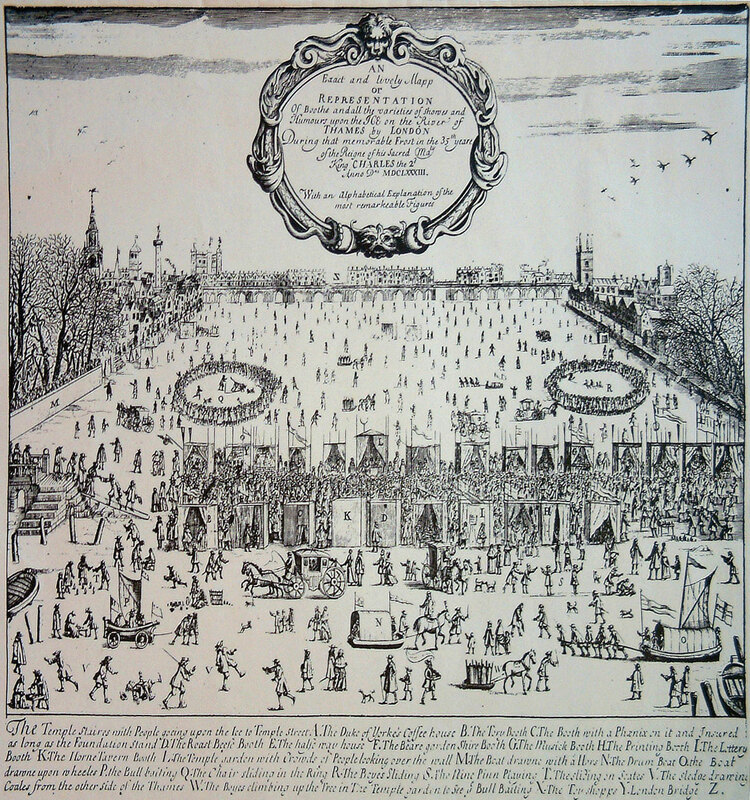 The first real frost fair was held in 1608 with events such as ice-skating, horse racing, plays and feasting. The winter of 1683-84 was particularly cold and even though much of the surrounding countryside and wildlife was killed off, the people in the city still found it a reason to party. 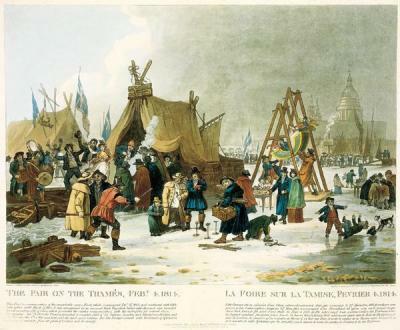 A printer set up on the frozen river selling souvenir printed cards that validated they and the buyer were on the Thames and would make the huge daily sum of £5 / $7.50. The ice was so thick and long-lasting that Londoners even built an entire street on the river with shops and eating/drinking establishments. However sometimes even ice several feet thick could melt in a day and there were obviously fatalities amongst those who didn’t notice. Later frost fairs were less about sports and animals but food and drink. The last frost fair was held on 1st February 1814 for four days when an elephant on the ice was one of the star attractions. However, the climate was already changing and though parts of the Thames have frozen since then as recently as 1963, a number of changes have conspired to make this increasingly unlikely. First of all the average January temperatures even in 1814 was -2.9 degrees Celsius whilst the most recent cold winters have seen average temperatures of +1.4 degrees C. Despite the climate change, it does still snow quite a lot just a relatively short distance out of London though nothing at all like it did just a few decades earlier. The urban heat island effect from all the concrete, tarmac and heated buildings mean that central London is often 5-10 degrees warmer than the surrounding countryside which in the winter means it rarely snows at all and in the summer can be surprisingly uncomfortable too. 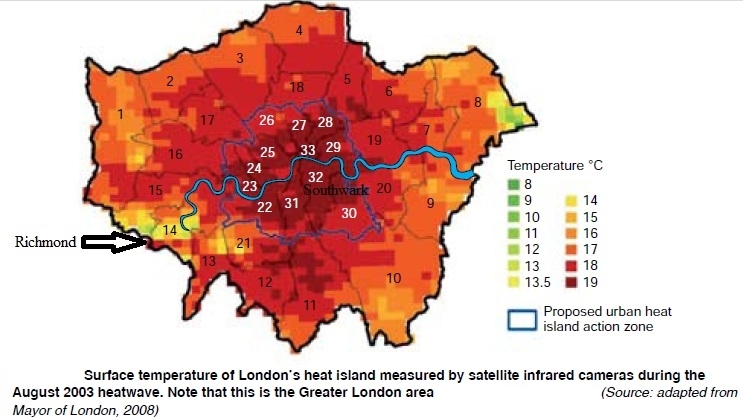 Map showing how much warmer central London is compared to its outer suburbs, let alone the countryside. Other reasons why frost fairs are that the river itself has changed. The old bridges in London had wide stone columns with wooden supports that acted like a dam allowing ice to more quickly build up as well as limiting the flow of sea-water further inland. In times gone by the Thames in London was a much shallower and broader river, it flowed much slower which made it vulnerable to freezing. However Victorian engineers built embankments on each side of the river making it narrower but deeper and with water flowing much quicker it again reduces the chances of future frost fairs. London used to have several beaches but most of these have been built upon. No matter how much it snows in London, the chances are the Thames will keep on flowing. This entry was posted in history, London and tagged Climate, Culture, Frost Fair, history, Life, London, Snow, Weather. Bookmark the permalink. Fascinating! Sometimes when I am taxed by a situation, and become anxious I often think what happened in times gone by and it helps with perspective. Interesting about how the weather impacts on us. Yes, if you think back to times gone by, it does put lots of things in perspective and shows up how minor and unimportant our problems are in the big scheme of things. It is fascinating about the weather, I wonder how many people emigrated to North America simply because they were fed up with centuries of cold weather… for their sakes I hope they headed south. That’s really amazing. I would love to go to a fair on a frozen river. Yes, that would be really neat. It would take me a while to get used to it, like walking over the aquarium glass with some great white sharks under neat it.